Norway's gentle giant Aksel Lund Svindal has strength, style and talent to burn but his great career has also been tainted by trajedy and a series of serious injuries. For while he is two-time overall World Cup champion and a three-time world champion it's been a rough ride for Lund Svindal, who calls himself Lund after his mother, who died in childbirth to his younger brother, who also passed away a year later. Shortly after he attained the highest peaks of his art, Svindal was involved in a horror accident at Beaver Creek, suffering a deep puncture to the left buttock and a broken nose and cheek bone. To gain a measure of the stone from which Svindal was cut though, after eleven months off the slopes rebuilding his body, he went back to Beaver Creek and won the downhill and the super-G! This giant of the North can rightfully take his place alongside other Nowegian Alpine heroes Kjetil-Andre Aamodt and Lasse Kjus. As a kid, Aksel's love of sport helped him deal with the pain of losing his mother. Also the fact that his father was a ski instructor and that his grand-parents had a chalet in the hills between Oslo and Bergen obviously steered him toward his destiny. At 23, as a very promising all-rounder he got a combined silver at the 2005 world championships in Bromio, but that promise wilted at Turin a year later where a fifth place in the super-G and sixth in the giant were considered scant recompense for his talents. 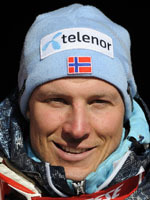 The 2006 season was not a complete white-out though as he won the super-G crystal globe. The phenomenal form we now associate with Svindal leapt to the fore at the 2007 worlds where he won both the downhill and the giant, triumphs followed by the World Cup overall title and crystal globes in the giant and super- combined. Injury ravaged his following season but at the 2009 worlds at Val d'Isere he took the super-combined title and came third in the super-G. Buoyed by this bounty he also took his second World Cup overall title on the final day and the super-G to boot. A massive man with a massive heart, he is a prime candidate to strike gold in the Canadian mountains come the Winter Olympics of 2010.